While I was absolutely blown away by all of the desserts from the top 10 honorees, I did have a few favorites. These desserts not only showcased each chefs masterful pastry skills, as they all did, but also happened to be in line with my personal sweet tastes. 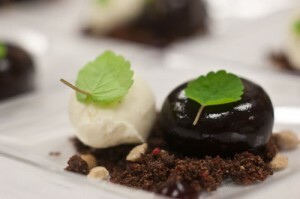 One such dessert was Yannis Janssens Foret Noire: with Manjari, Kirsch Chantilly and Griottines. This was a modern spin on black forest cake (which normally I don’t even like). The key to this dessert was the masterful handling of the two different layers of chocolate in each component which I learned are hand dipped. Each component had a very uniform and smooth outer chocolate layer. Then, inside there was a completely different type of chocolate with the same smooth texture. The two types of chocolate in the darker half were very rich and flavorful and not too sweet. Yannis notes one of the chocolates in the title of the dessert “Manjari”, in reference to Valrhona’s Manjari dark chocolate which features Madagascar beans. Very pro! Easily worth a trip to Miami. Check out the video to learn more about the dish. Part III (with Johnny Iuzzini and Michelle Tampakis) is here.